Each year for my birthday (it’s happened twice; that makes it a tradition! ), my friend Fifi writes me a story about that year’s Eurovision (which conveniently, usually happens only a few days before my birthday). I hesitated to show them to anyone else because of a) all the inside jokes, b) the unreferenced quotes from various shows etc., and c) the possibility that people who didn’t share our sense of humour might find them offensive (I intend them as loving parodies only, of course, but I don’t know if the world at large would get that). I do believe that other people will enjoy these, though. As long as you bear in mind that this is, as Fifi has said, a loving parody. Consider yourself disclaimer’d! Ten years it had taken them to reach this moment. Ten years of arduous training, of bitter rivalries, of struggling faith, of faltering hopes. Ten years of being told that they would never survive the stringent tests, that such mere mortals as they should never aspire to such glorious heights as this. Yet they had reached this moment. They were here. They were soldiers, preparing to battle for the honour of their homeland. They were artists, preparing to stun the world with their vision and skill. They were actors, preparing to exercise the subtleties of deep and nuanced performance. 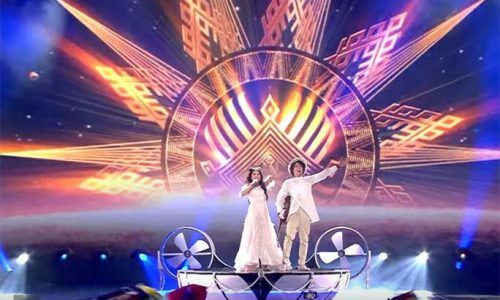 They were Moldova, and they were going to win Eurovision. Bjokar settled the hat on his head. Pinned to his head with eighteen paperclips, two metal clamps, and several ounces of hot glue, it was accursedly uncomfortable. But Grandmother Sxderzuz had sewn it herself—had spent three years weaving the fur from her finest animals and fashioning it into elegant swirls—and he had promised her he would wear it. Anyway, if Grandmother Sxderzuz made you a hat, you wore it. No questions asked. He surveyed the other members of the group. His friends, his companions of the heart: brother; cousins; that one guy who’d wandered in from the crowd. (The hell? Couldn’t he have at least worn a hat?) Yes, it was as he’d thought. Bjokar suppressed the tears of pride: his hat was definitely the nicest. Fgojik tossed his head angrily (then staggered as the hat swung too wide and threw him off balance). Typical Bjokar, making it all about himself. The rage—the steady simmering rage that had consumed Fgojik’s heart since he was a child—flared. Bjokar: always the favourite. Fgojik threw him a startled look. The call came again. Onto the stage they bounded, Bjokar in the lead (Of course, thought Fgojik angrily. Of course of course of course…), Guy From The Crowd waving merrily to the masses. They seemed to love him; one girl fainted when he smiled at her. Truly the spirit of Eurovision was in the air. So lucky. They were so lucky to be here. “SO LUCKY,” bellowed Bjokar. Ahh, how he remembered writing this song. How he had poured his experiences into every word and every note. The clarinet began its delicate solo. Filuše emerged from the back of the stage, a fairy pure and pale as gossamer, her pointed white hat glittering under the lights. Poetry in motion, she soared across the stage on her unicycle. Filuše had trained in the mystic arts of the unicycle since she was a child. It was tradition; her mother had been a cyclist, and her mother’s mother. Also, in its circus days, the family dog. At several months of age, Filuše began to toddle. Her grandmother noticed, and smacked her. “In this family,” she scolded, “we learn to cycle before we learn to walk.” She placed Filuše on the miniature unicycle that had soared Aråmĕithe, the family dog, to fame. Two years later, once the little girl could wheel a passable circle around the garden, she was permitted to place feet to ground and learn the overrated art of walking. Theirs was a relationship of turmoil and heady pain, Bjokar ruefully reflected. He and Filuše had known each other since she was on miniature unicycles and he was in miniature gnome hats—namely, since they were five. They had met on a Tuesday, declared their love on a Thursday (Wednesday had been busy), and since then had suffered twenty years of tumultuous and inconsistent devotion. But then, his had always been a world of troubled relationships. Look at his family. Fgojik, his brother or half-brother or possibly twin sister, depending on whose history of family scandal you listened to. Vånštuk, his youngest cousin, who had torn Filuše away from him twice and given her back three times. Zxozq, his oldest cousin (or half-brother or uncle or neighbour wandered in off the street, depending on who you listened to), who had never forgiven Bjokar for shattering his dreams of clown college (but really, did you see the hats they made them wear at that place? ), despised Filuše for breaking his heart (or not breaking his heart or making him the happiest man in the world, depending on who you listened to), and seemed pretty much indifferent to Vånštuk (who was his brother or his half-brother or possibly his twin sister, depending on who you listened to). Indeed, they were a lucky group. In a blaze of lights and glory and strategically placed monocles, the song ceased. Bjokar glanced around to see Guy From The Crowd nodding at him with soulful approval. Bjokar obligingly Looked Soulful back. The monocle helped. He dropped Vånštuk’s hands, clasped his shoulder in wordless joy, and wandered off to compliment Filuše on her unicycling. “Who is that Guy?” demanded Vånštuk. “What Guy?” asked Zxozq distractedly, pulling at his hat. It seemed to be stuck to his head. “The one over…” Vånštuk trailed off as he turned to find Guy From The Crowd gone. A hush fell among them. “He just…disappeared,” whispered Vånštuk, awed. “No, wait—there he is,” observed Fgojik, pointing. They turned to see Guy From The Crowd engaging in a passionate embrace with Filuše. Bjokar grunted and strode over to break them apart. Zxozq finally succeeded in separating his hat from his head. Alas, this maneuver also involved separating his hair from his scalp. The scores were tallied, the judgments made. With a searing jolt of disappointment, Bjokar heard the word Azerbaijan: the word defeat. Zxozq dropped his raggedly bald head into his hands. Their spirits lifted. Zxozq raised his head, smiled, and resumed gluing his hair back on. Vånštuk reflected that he quite liked fish really. Maybe it would even be a cod! Bjokar, absentmindedly tugging Filuše away from Guy From The Crowd again, contemplated the future. The man was right, after all! What was to stop them from trying again, succeeding again? They were soldiers, preparing to battle for the honour of their homeland. They were artists, preparing to stun the world with their vision and skill. They were actors, preparing to exercise the subtleties of deep and nuanced performance.